My time was extremely limited at this year’s NQC but I’m so glad to have been able to attend the Wednesday and Thursday evening concerts. It was amazing how different the crowds were between the two nights, with Thursday night’s crowd really filling the concert hall. 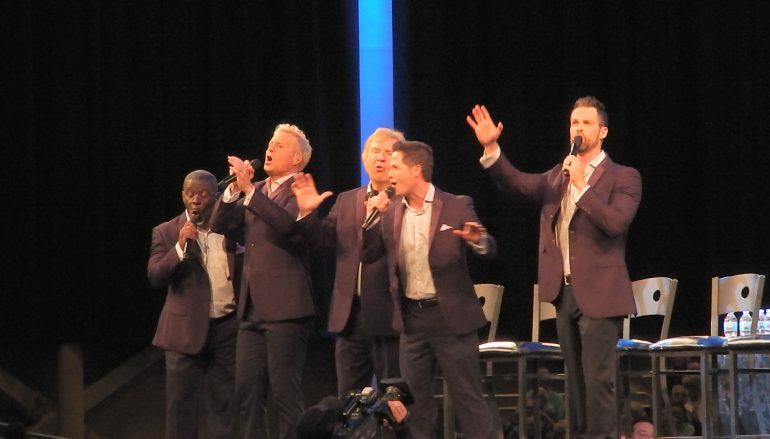 I know that the Gaither Vocal Band is always a big draw, but so many of my personal favorites were on the program as well. I didn’t take many notes and I captured no videos to post but I’ll offer a few comments about the evening. Carolina Quartet was the first group up for the concert and performed a great set. 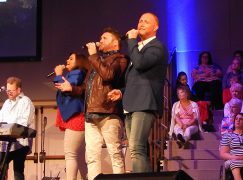 I had seen this group at Dollywood’s Southern Gospel Festival a fews years ago and remembered them as being very, very good. The note I made from their set was that I need to add them to the list of bookmarks on my laptop so I can find a date on their tour where I can see them in full concert. Gold City also had a great set. They sang a couple of the songs that will be on their Hope For The Journey CD to be released next month – “I Can Tell You Why” and “Those Same Hands,” both of which were very nice songs. The Ball Brothers’ set was special to me partly because of the introduction of their new bass, Rhett Roberts. They performed a brand new song – “Old Church Choir.” If you keep up with the Ball Brothers, you know that they are experts on using social media. Last Sunday, they released a video of this song on Facebook that includes their new bass singer and it has already gathered more than 300,000 views and over 7,000 shares. 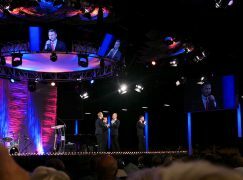 I’m really enjoying Jon Epley with Greater Vision and the crowd responded very well to his feature on “Why Me, Lord.” I noticed many people singing along with them. I don’t know why there wasn’t a bigger response as well to one of their older songs – “Paid In Full (Through Jesus Amen).” It’s one of my favorites and I’m glad they’ve brought it back on their newest recording, Still! 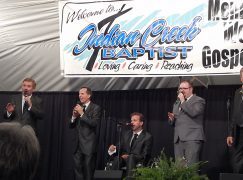 The highlight for me from the Tribute Quartet set was Riley Harrison Clark’s feature on “When The Prodigal Comes Home.” That young man can evermore sing and he released a solo CD entitled “Welcome To Me” this week that is very good. The Primitive Quartet was another highlight for me mostly because they played their instrumental of “He Looked Beyond My Faults” which is so beautiful. Legacy Five’s pianist, Josh Townsend, shared his testimony again, by popular demand! This young man won the Young Artist fan award on Wednesday, his 21st birthday. I spent a couple of hours Thursday afternoon and evening walking through the artist exhibit areas to visit with so many artists and friends – and that’s the biggest highlight for me!